Our e-books page links to e-book editions of our publications available for the Amazon Kindle and at Google Play. As an Amazon Associate Scripture Truth Publications earns from qualifying purchases. The 2020 edition is at the printer. Copies can soon be ordered on our Cheering Words calendar web page. A new edition of the 1978 words-only edition was published on 7th June 2018. It is attractively bound in hardback black or dark blue leather-effect vinyl boards and replaces the previous soft vinyl-bound edition. Questions are asked from time to time as to the reasons why this particular selection of hymns was chosen. The 1978 preface gives some reasons, but tantalisingly refers to the prefaces in earlier editions for further explanations. Clearly few people today have access to these. Therefore, particularly for the benefit of newcomers to this hymn book, as well as the Preface to the 1978 edition, we have included statements by G. V. Wigram, J. N. Darby and T. H. Reynolds, the editors respectively of its predecessors published under the title of The Little Flock Hymn Book in 1856, 1881 and 1903, which, between them, provide an excellent explanation of the purpose of the hymn book and the reasons for the selection of hymns made. Errors in capitalization and the metres shown for some hymns have been corrected. The list of authors has been extensively updated. A thorough review of the hymn metres has been conducted and a completely new metrical index with useful comments has been provided. Read an article from a recent issue of Alive! Do you want a bi-monthly topical evangelistic tract to distribute? Then Alive! is just what you're looking for. It costs £8.00 per 100 (plus postage). To order Alive!, send us an e-mail via the Contact Us page. 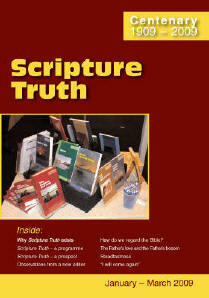 "Scripture Truth", first published in 1909, is a 32-page quarterly magazine full of sound and challenging Bible teaching. It regularly contains articles, studies, poems and points to ponder. The present editor is Dr Theo Balderston. The annual subscription for 2019 is £12.60 (post free) in the United Kingdom and £17.00 (post free) in the rest of the world. You can place an order for a subscription for the current calendar year and make an immediate online payment by debit card (in the UK) or credit card on our Scripture Truth magazine page. A booklet for Jehovah's Witnesses, comparing their beliefs on vital topics with the teaching of the Bible: What Does The Bible Teach? by Ron Mahers, now re-printed in an attractive pocket-sized format. Available in single copies or packs of 10 or 100. The Amazon Kindle edition of “Faith with Fortitude: Memoirs of Mama Ketshi” by Beryl Harris; is available in the following Kindle Stores: Australia, Brazil, Canada, France, Germany, Holland, India, Italy, Japan, Mexico, Spain, UK and USA. We still have a number of copies of the print edition which can be purchased at our Amazon Marketplace store. To try out the service, use the box below to enter a specific word or phrase, and then click "Search Books" to search through all our books on this service. Not sure where to find what you're looking for? Search this site! Please note: For security reasons, forms on this web site cannot be submitted from copies of pages saved to your local disk drive.